Hi guys, I thought I'd try something new on the blog today, which is handing over the reins (my computer keyboard) to Will for him to review a beard kit he's been loving. Will is looking to create a blog himself and I thought this may help with building his confidence to take the leap to create his own blog! Hopefully, you enjoy this post and let me know in the comments if you'd like to read more of Will's reviews. 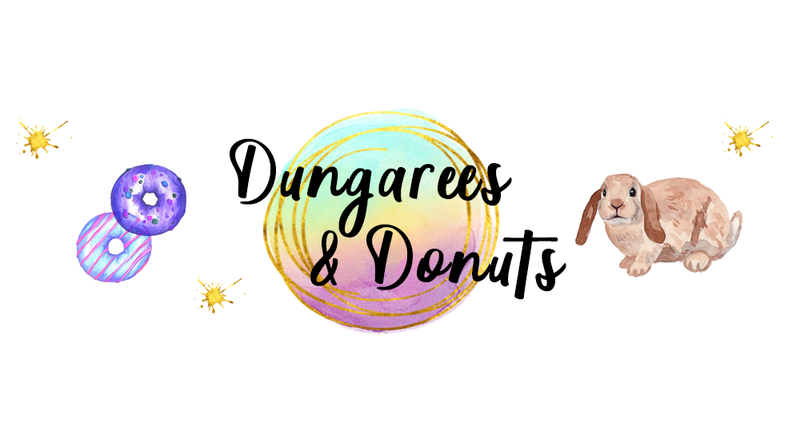 Hi I am Will, and I am Olivia's boyfriend and a novice beard enthusiast and I decided it would be fun to review my new Mo Bros' Grooming Kit on Dungarees & Donuts. I hope you enjoy and speak soon! I've had a beard for over a year now, and I don't like to look back on my clean shaven days anymore. I like to think back to the episode of 'The Office' where Andy goes travelling and returns with a messy, overgrown beard. When he returns to his job and shaves, he regrets it, saying his beard was his 'Security blanket' and that's strange how I feel about mine now. The thing is, I spent about 2 years not knowing how I could care for my beard. I'd just grow it out, shave my face, and repeat. It was really inconvenient for me. Recently, I purchased a beard trimmer and that's helped me a little more to maintain my beard for a year, but I recently discovered products for beards and it's changed everything for me. I saw the Mo Bro's on Dragon's Den not too long ago and liked the sound of their product, I noticed all three of them had different types of facial hair which I thought was interesting. 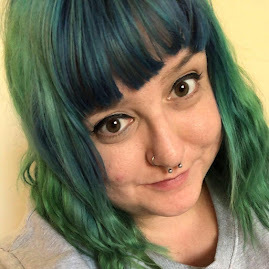 I was given the opportunity to try their product and here's my experience with it. The Mo Bro's make a beard grooming kit, and I can't recommend it enough - it's got all the basics a man needs to help clean up his beard. Messy, unkempt beards aren't the only beard problems a man might face, there's also itchiness and embarrassment when eating. The kit also comes in a tin which I think is pretty cool, since there's a lot of different little pieces you can store everything together. It's very compact so if you were travelling it would be great. The scent of this grooming kit is called 'Winter Spice' and it smells exactly how you'd expect, I'd say it reminds me of a Christmas scented candle. It smells very natural, it makes me think of walks through a snowy forest. The scent of the wax and balm isn't too overpowering - you can still smell it, but it's not too strong which I think is great. I'd describe the scent as being 'masculine'. The beard balm is one of the best I've used, it's not too moist which means it has a good hold of my beard. Balms I've used before leave too much of a shine in your beard, this one does that too, but it's more subtle and gives more of a natural look instead. Although I don't rock handlebars on my moustache, for someone who does I think this wax could be the best part of this grooming kit because it has a really strong hold, which makes it really stand out in the market of beard products. Don't be put off by the size of the pots, 15ml is more than enough product. I've found myself in the past using too much beard balm and leaving my beard looking unusually shiny, so this kit has helped to teach me how much product I should use. The wooden comb is something I've wanted for a while but never got around to buying, I'd usually use a cheap 99p plastic one which would hurt my face. 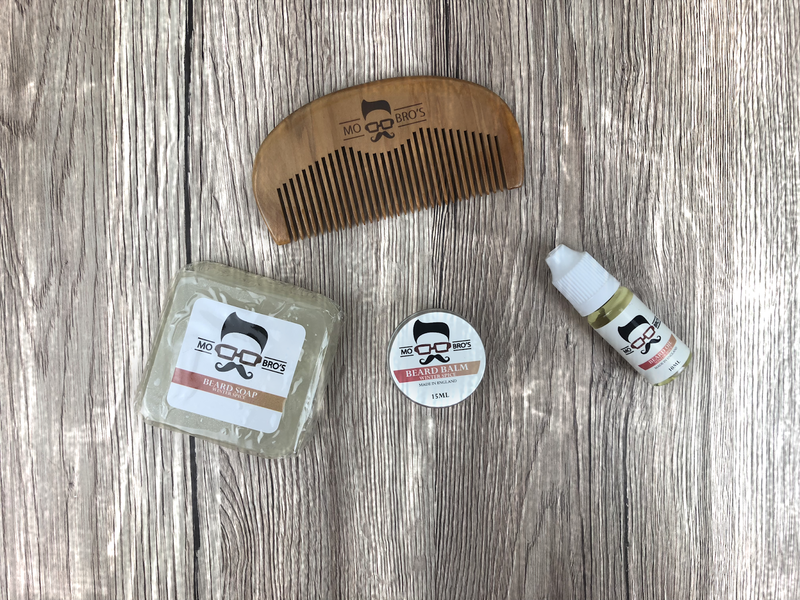 The wooden comb doesn't hurt my face and the best part is beard balm or oil doesn't stick to it, making it perfect to reuse. It's nicer to hold than a cheap plastic comb and actually makes combing your beard a better experience. The most annoying part of having a beard for me is my moustache. When the hair grows longer and it touches my upper lip it's the most frustrating thing ever! If I eat, sometimes food might get caught in it and I won't notice until I look in the mirror or somebody points it out. My beard trimmer helps to neaten that up, but I can't really do a good job with it. 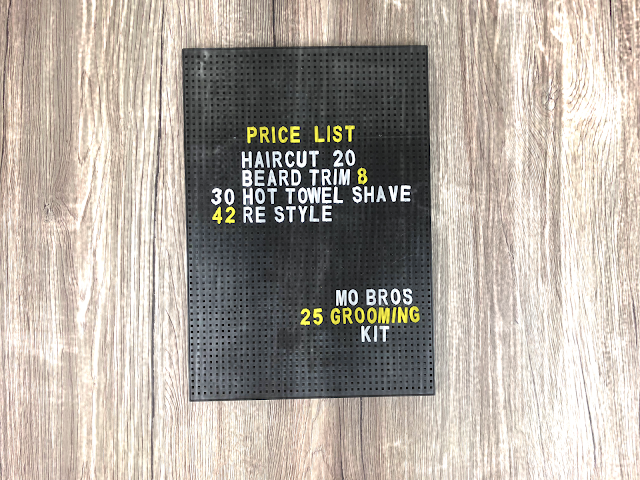 Since I've used the scissors in the Mo Bro's grooming kit, it's really helped me to neaten up my moustache and stop those hairs from getting too long and annoying. Not only is it great for maintaining moustache hair, they are also great for cutting any longer, wiry beard hairs that appear. I do genuinely recommend this product to any man wanting to try and experience new beard products. It currently has a retail price of £25 which isn't bad considering what you get in the kit, you get all the essential products and the user experience is really good. Everythings straightforward and the products aren't confusing so you'll be able to tell what does what. The kit includes a tin and bag so you can store away the products safely and hygienically, so there is no need to worry about damaging or getting the products dirty. This is something I know absolutely nothing about, so it was really interesting! Love the comparison to Andy in the Office haha. 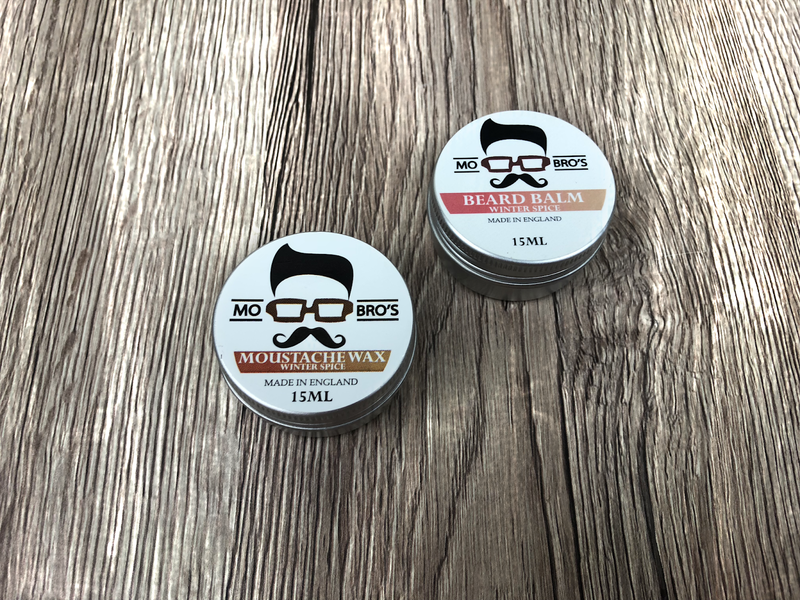 I love the products from Mo Bro! My boyfriend has products from this brand in the scent winter spice. They last ages and work wonders on beards.